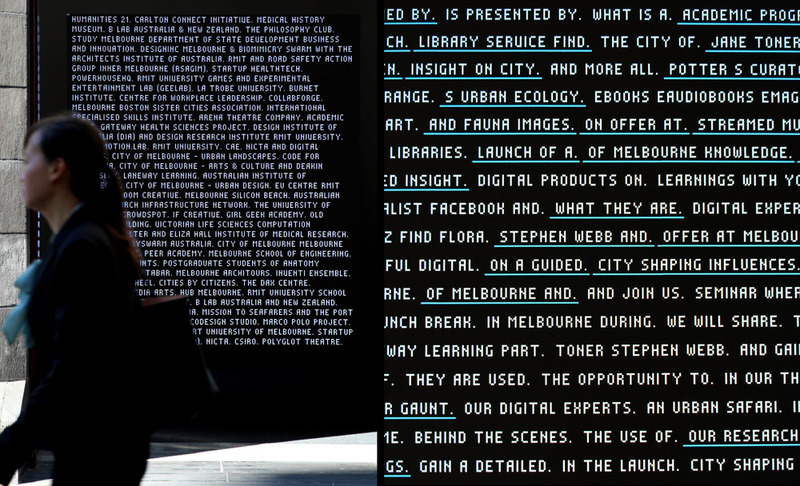 Live data-driven installation for the City of Melbourne Knowledge Week 2014. Knowledge Wall - developed for City of Melbourne - presents event information, data visualisations, statements and imagery in the Knowledge Hub space in Melbourne’s Town Hall building. The screen and software installation treats the text of the event as a data source, and looks for connections between the event statements, live twitter conversations, open data sets and event themes. Using a large LED screen (2.7M tall X 2.2M Wide) the installation is highly visible from the street to pedestrians, cyclists and commuters on the tram. Developed for City of Melbourne: including imagery from Places for People, Urban Landscapes, and assistance from City Lab.